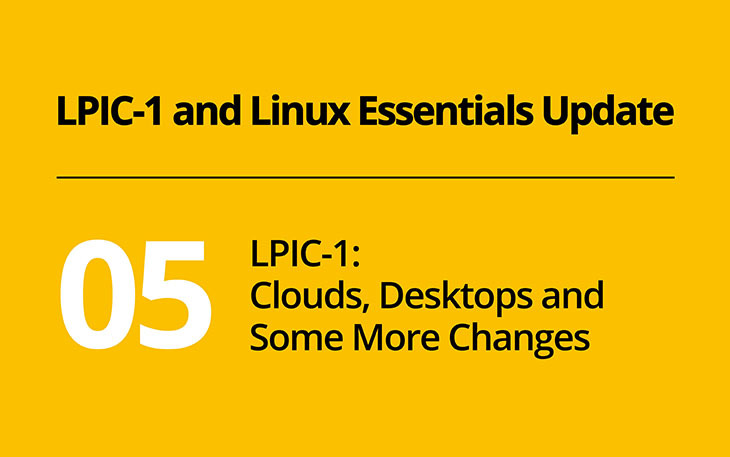 Besides the topics discussed in the last posts, LPIC-1 version 5.0 introduces various small changes which we will discuss today. Most noticeably, the new objective ‘Linux as a virtualization guest’, was added to exam 101. This objective covers specialties of running Linux in virtual machines and containers, both on premise and in the cloud. You should understand the general concepts and differences of full virtualization and containerization, and how Linux is installed in such environments. You probably have already worked with a virtual machine while preparing for your LPIC-1 exams. Remember that this objective is not about a specific virtualization product, but about the general concepts. Besides virtual machines, containerization gained more and more attention in the last couple of years. Docker’s ‘What is a Container’ websites summarizes these differences briefly. Mark Bayazit’s blog, ‘Linux Containers – A comparison of LXC and Docker’, goes into further details and explains what makes application containers, such as Docker, different from other containerization approaches. Another special aspect of virtual machines are Infrastructure as a Service (IaaS) clouds. These offerings grant access to a virtual machine which is usually automatically installed from an image. Most cloud providers offer free test accounts. If you don’t have access to an IaaS cloud yet, pick one of the big ones and get a free test account. Set up a Linux instance and try to do some of your LPIC-1 preparations in that machine to gain some experience using Linux in the cloud. Package management now includes zypper (objective 102.5) as well as awareness of apt (objective 102.4) and dnf (objective 102.5). Objective 103.7 was increased by one weight and now also covers the differences between basic and extended regular expressions, how to handle special characters, character classes, quantifiers and anchors and how to delete, change and substitute text using regular expressions. The RegexOne tutorials are a great place to start learning regular expressions. regex101 offers a more advanced playground for regular expressions. If you want to practice your regex skills, check out Regex Crossword. But be warned, it is addictive. Regarding storage, objective 104.1 raised Btrfs from awareness level to full coverage of its general usage as well as multi-device filesystems, compression, subvolumes and snapshots. Btrfs is not trivial, so you should spend some time to really understand how it works. A good place to get started is the Oracle Linux Btrfs documentation. You might want to use a virtual machine with a few virtual disks for your experiments. Finally, review Btrfs’ Sysadmin Guide which summarizes a lot of these concepts and the collection of use cases which shows how to use Btrfs for numerous purposes. Topic 106, User Interfaces and Desktops, was changed to focus on what is relevant when setting up a Desktop on a recent Linux distribution. Nowadays, Xorg usually works out of the box, therefore objective 106.1 was changed to test general concepts of a Linux desktop, including the ability to overwrite specific aspects of the Xorg configuration and manage remote execution of X programs. Objective 106.2 focuses on graphical desktops and remote access protocols and objective 106.3 covers general concepts of accessibility. Besides the changes discussed in this blog series, a lot of other topics received smaller additions and cleanups. The LPI wiki provides a summary of all changes between version 4.0 and 5.0. This list might be particularly helpful when learning with materials which have not yet been updated to the new version. Pay special attention to topics which have been removed from the objectives, such as quotas and SQL, to changes in weights and to commands and knowledge areas which were removed or added. When you’re studying for your LPIC-1 exams, make sure to work closely with the latest version of the objectives. Remember that the objectives set the scope of the exam and ultimately define LPI’s expectations on the candidates. Next week we will take a look at the new objectives for the Linux Essentials certificate and review the changes introduced in version 1.6.